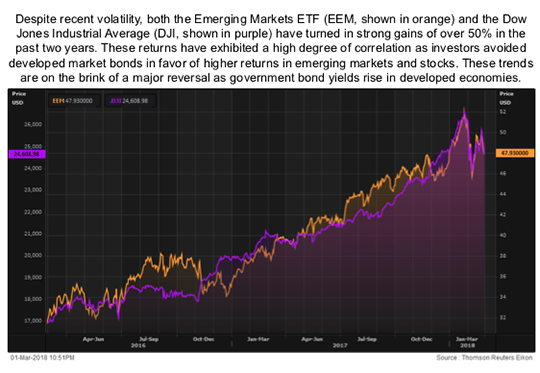 This post Trouble Brewing in Emerging Markets appeared first on Daily Reckoning. Emerging markets, EMs, have had an amazing run over the past two years. Moving in lock step with U.S. stock markets, the leading EM stock ETF has produced gains of over 50% since early 2016. But just as U.S. stocks have run into higher volatility and major drawdowns in recent months, EM stocks have also encountered head winds. A major reversal of EM stock gains is emerging. Your correspondent in front of the ruins of Al-Khazneh (the ?Treasury?) 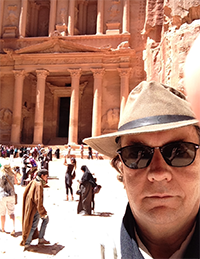 in the ancient city of Petra in a remote part of the Jordanian desert. These ruins were featured in the Indiana Jones film series. I spend about 30% of my time in overseas travel, and about half of that in emerging markets, from China to Africa to South America. Emerging markets have seen rising asset prices since 2009 as global investors sought higher yields than were available in developed markets. Now that the U.S. is raising interest rates, an outflow of hot money from the emerging markets back to the U.S. may lead to a global credit crisis. The reason U.S. stocks and EM stocks have moved together is not difficult to discern. Both asset classes are what economists call ?risky? assets, in contrast to ?safe? assets such as developed-market government bonds or even ?risk-free? assets such as short-term U.S. Treasury bills. (Of course, no asset is truly risk free. The U.S. credit rating suffered a downgrade in 2011 and may be downgraded again later this year). These distinctions between risky and risk-free assets are used by portfolio managers to construct diversified portfolios that attempt to optimize total returns on a risk-adjusted basis ? that is, taking into account volatility, return and liquidity. The difficulty is that major institutional investors such as banks, insurance companies and pension funds have return targets they must meet in order to have a profitable and competitive business. These return targets come from promises to insurance policy holders, retirees or stockholders. Naturally, portfolio managers are expected to take more risk in order to earn higher returns. Developed-market government bonds have been unattractive to many portfolio managers for the past decade. These bonds offered negative returns in the cases of Japan, Germany and Sweden. Returns were not much higher in the U.S. and Canada. Pension managers and insurance companies in particular expect their portfolios to meet return targets of 6?8% in order to pay promised benefits. With government bond rates stuck near zero, these portfolio managers went elsewhere in search of higher returns. Many low-yielding developed-economy government bonds were purchased by the central banks of the issuing countries as part of money printing programs intended to drive down yields and force investors into risky assets such as stocks and real estate. This effort on the part of central banks to reduce yields on safe assets and force investors into risky assets, known as the ?portfolio channel? method, was supposed to produce a ?wealth effect.? In theory, investors would drive up stock prices, which would encourage consumer confidence and consumer spending and ultimately result in a return to trend economic growth of 3% or higher. The wealth effect never materialized. Consumer confidence was boosted by higher stock prices but consumers never increased their spending to any significant extent. Instead, they paid down debt as a way to repair their personal balance sheets after the historic losses of 2007?08. Instead of producing more consumption, the portfolio channel effect only produced asset bubbles in U.S. and emerging-markets stocks. Investors chased the stock market higher as a way to meet their investment return targets. The same was true in emerging markets. EMs also borrowed heavily in dollars at low rates to finance the expansion of their manufacturing and export capacities. U.S. and EM stocks enjoyed a ?Goldilocks? moment the past two years. Institutional investors purchased these assets for higher yields. The purchases drove up prices, which attracted more buying. The feedback loop continued as higher prices encouraged more buying, which led to higher prices, and so on. The persistence of this feedback loop practically eliminated volatility, as stocks seemed only to rise and never fall. Computers interpreted this absence of volatility as a sign that these markets were less risky, since volatility is a standard measure of risk in prevailing risk-management models. Using ?risk parity? approaches, the computers then bought even more equities because they seemed to offer an optimal combination of high return and low risk, the Holy Grail of investment management. Now lately this entire process has been thrown into reverse. The three bears have returned home and Goldilocks has jumped out the window and fled into the forest. The primary cause of this reversal is central bank tightening. This already exists in the U.S. and is coming soon to the U.K. and the eurozone. Japan may be a few years behind the rest of the developed world but it is also working toward policy normalization. The result is that yields on low-risk developed-economy government bonds suddenly look relatively attractive to institutional investors compared with the drawdowns and increased volatility of U.S. and EM stocks. The Great Unwind has begun. Hot money has been heading out of stocks and moving in the direction of government bonds, where higher risk-adjusted returns await. With this market backdrop in mind, what are the prospects for emerging markets in the months ahead? Outflows from EM stocks have just begun and are set to accelerate dramatically in the months ahead. This could lead to a full-blown emerging-market debt crisis with some potential to morph into a global liquidity crisis of the kind last seen in 2008, possibly worse. This is an extremely potent combination. Slower growth in China, a global trade war and an epic portfolio rebalancing from stocks to government bonds will sink U.S. and emerging-market stocks. The best case will be a 30% drawdown in stocks. The worst case will be a new global liquidity crisis that makes 2008 look like a warm-up for the main event. The post Trouble Brewing in Emerging Markets appeared first on Daily Reckoning.